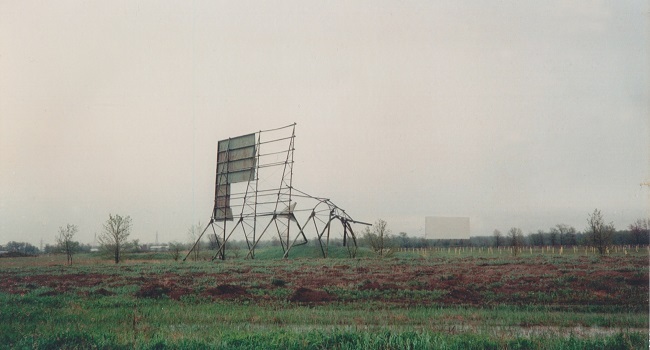 On the night of May 20, 1996 a tornado hit a drive-in theatre in Thorold, Ontario. The moment was notable due to the fact that the summer blockbuster Twister was playing at the time. Or at least that is how the story goes. Depending on who you talk to, some will say the screen ripped apart just as the twister within the movie was touching down on a fictional drive-in. However, none of these accounts are accurate. Sure property was damaged due to the fury of Mother Nature but, according to staff working that night, the theater closed early due to the bad weather. Plus Twister was scheduled to play on a different screen entirely. Of course that has not stopped the urban legend surrounding the night from growing with each new retelling of it. Hot off the heels of his stunning documentary feature How to Build a Time Machine, which debuted a few months ago, filmmaker Jay Cheel returns with Twisted, a documentary short that looks at the thin line between fact and fiction when it comes to urban legends. Interviewing those who claim to have had firsthand experience of the night, Cheel weaves together a witty and fascinating exploration of the fluidity of memory. Showing how easily memory can be altered via the slightest embellishment, as well as our need to feel a sense of belonging, Twisted is a delight. It will have you pondering not only the validity of the stories others tell you, but also our own tendencies to exaggerate events we claim to remember. What a great premise for a movie. Interesting story about the drive-in, Courtney. It is indeed a really great premise. Hopefully you will get a chance to see the film online after it has completed its run on the festival circuit.